Frenemies are the staple for conflict-packed stories. It’s a relationship dynamic that runs the gambit of emotions. It’s the subtle barbs of a disgruntled coworker. It’s the lingering sad but quietly malevolent vibe of a jilted ex-lover. And it’s the deliberate backstabbing of a fair-weather friend. 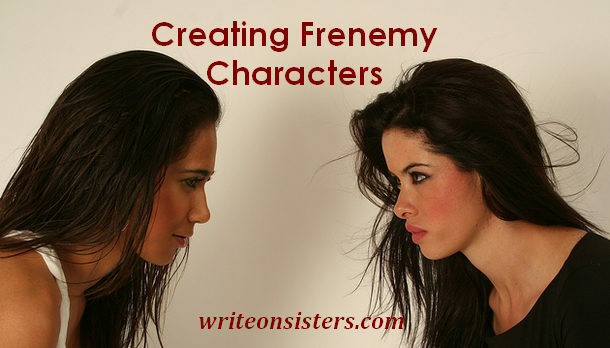 Frenemies of every kind are particularly popular in teen character creation, but they’re nothing new to writers. Jane Austen played off the dynamic notion of an enemy masquerading as a friend in several of her novels. Just think of the complicated relationship between Isabella Thorpe and Catherine Morland in Northanger Abbey. 1. a person with whom one is friendly despite a fundamental dislike or rivalry. How do people with common interests, who run in the same work and/or social circles, manage to cross the line? Well, it usually begins with some level of self-interest. The corresponding behaviors range from the annoying to the pathological. This type of character plays a major roll in the project I’m working on this fall. My lead character, Jade, is a frienemie to her ex-boyfriend’s new girl with disastrous results for everyone. This frenemy just has no real interest in others. Their world view has room for one star in the sky and they are it! It’s not so much that they want to hurt others, it’s just that others aren’t as smart, as dedicated, as driven, or as worthy of success as they are. They are single-minded and hard working; they win small and large contests with all the commitment of a world class athlete. Personal Motto: Good things come to those who hunt them down and kill them with a big stick. They’re up, they’re down, and they’re lost. They’re looking for others to pity them, clutch their hands in support, and show them the way. Of course, once directed to a suitable path, they will still go the other way and cause chaos. This frenemy’s prickly and unpredictable nature means they require constant attention. Personal Motto: What have you done for me lately? Jealousy’s glow is an ugly shade on anyone, but this frenemy is sporting some shamrock colored karma that demands some redecorating. At the core of envy is low self-esteem and a dose of greed. They want the other person’s success so badly they can taste it. And they resent and denigrate their friend’s accolades with growing malcontent. The Green Meanie doesn’t understand why success proves so elusive, unless their friends are sabotaging them. Paranoia and conspiracy theories are the Green Meanie’s true BFFs. Personal Motto: Blowing out another person’s candle will make mine brighter. The path to success is paved with the discarded hulls of others. These frenemies are the first to wrangle an invitation to the party and the last to help with the clean up. They are often charming, attractive and know how to work any social situations like a public relations pro. They gravitate toward money and power, always realigning themselves with new friends for maximum gain. Personal Motto: Life is a journey, and I arrive first and in style. Walking in the spotlight feels good, and it’s okay if a little light bleeds ever so gently onto others and long as the MVP hogs the focal point. MVP don’t mind if friends own a much smaller spotlight or if they’re successful in another area of the shared social web. But friends should never go head -to-head with the MVP on home turf, it will not end well. Personal Motto: I play to annihilate, because he/she who dies with the most trophies, press clippings, and awards wins. Stupid in the name of love, friends fall by the wayside when the object of this frenemy’s affections beckons. Likewise, their love is always the one true affection, whereas their friends get mocked for their silly crushes. No one can equal the scope of the Love Lunatic’s passion, save Romeo and Juliet of course. That pair is ideal in all things. This frenemy will only return to the fold once love has gone awry. In lost love’s melancholy stage, they will demand everyone’s full attention, until the next true love comes along. Personal Motto: Love triumphs all, until it doesn’t! This frenemy knows just what they’re doing. They’ve learned the art of how befriend and betray at Machiavelli’s knee. They get close fast and study their prey from every angle. When they strike, it is without warning and for maximum suffering. If they are really good at being bad, they might even convince the injured party to apologize. Personal Motto: Sometimes you need to lose a battle to win the war. Young adult fiction is positively bursting with frenemies. Using many means (gossip, slander, blackmail), these characters advance their campaigns of self-promotion at any cost. Throwing in a frenemy character never fails to create some extra tension in a group. Have you ever written a frenemy relationship? If so please share your experience. Most of us can remember someone like this, perhaps from our teen years. There are real people like these everywhere. Sad, but true. I think a lot of crime novels have characters that share some of these aspects, and frenemies would make great murder suspects. They would indeed, Robin, if I didn’t kill them all off. Ha! They work great in YA because of the closed nature of a teen’s social circle. I used to know someone who was friends with a Grand Schemer and kept getting burned while thinking it was her fault. Ouch! I tried to convince her to walk away, but no luck. It might be interesting to look at the flip side – those who are friends with frenemies and why they stick with them. Sue, you have hit on a great point! The type of person who repeatedly falls for this routine has some issues to work out. These relationships are a form of codependency. Schemers can’t fool everyone, that’s why you spotted the problem. For them it’s like running a con, they have to start by picking the right target. Sorry about your friend, falling in with a grand schemer is bad news! Love this! Great tips and, agreed, throwing in a frenemy character can’t hurt. Yes –> “Young adult fiction is positively bursting with frenemies.” I’ve noticed this… Is it the genre? The age group? Because, I must say, most people would agree teens have frenemies but, really, so do grown-ups. We just present it differently. YA is ripe with them and I would say it’s the age. Younger people in real life have more of them because they are just less experienced at reading the signs. But of course they are everywhere in the real world! And at every age range. You see them a lot in work circle dynamics. I’ve been studying some good fiction examples lately, Libba Bray writes some great ones. But these characters are not easy to sort into character types, that was why I started thinking of how to group them. The post just sprung out of my own frustrations and research. Glad you liked it. It IS an art, isn’t it? Great post!